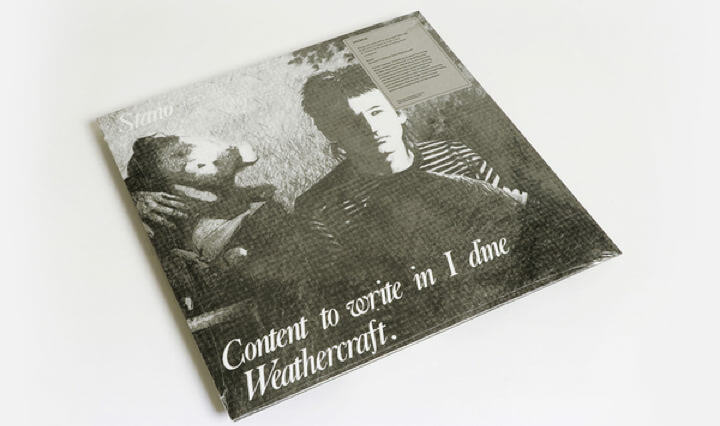 One of the year’s most crucial wave reissues, Stano’s debut LP ‘Content to write in I dine Weathercraft’ is a seminal and sought-after Irish post-punk album starring two rare appearances by the near-mythical Michael O’Shea. Nothing less than an essential recommendation to anyone familiar with the Michael O’Shea LP, Finders Keeper’s ‘Strange Passion’ compilation, or early Dome experiments! We can barely contain our buzz over this reissue. From its wild DIY drum machine programming to the appearance of O’Shea’s cymbeline-like home-built instrument and the cut ’n splice, layered song arrangements, ‘Content to write in I dine Weathercraft’ is one of those blue moon reissues that, in hindsight, seem to blow away so much other, better known material from the era whence it came. As spotted with ‘Town’, a highlight of Finders Keepers’ great Cache Cache compilation, ‘Strange Passion’, Stano’s mix of hands-on drum machine rhythms and bittersweet songcraft remain among the strongest examples from Dublin’s punk/post-punk scene of the early ‘80s. And judging from the 2nd hand asking prices of ‘Content to write in I dine Weathercraft’ in 2018, quite a few other listeners are patently aware of his prowess, too. A former member of The Threat (also found on ‘Strange Passion’), John Denver Stanley or Stano recorded his first album in Dublin’s Alto studio, in the basement of late C.18th Irish Nationalist leader Robert Emmet’s house, where he made sublime use of the studio’s natural reverbs, inviting around pals and peers to work in a musique concrete-like method of playing, processing and editing to achieve the wickedly unpredictable, flowing chicanery of his first album. The two appearances of Michael O’Shea and his Mo Chara (a self-built, 17-string, zither or cymbeline-like instrument with pick-ups) are noteworthy not just for their haunting beauty, but also their rarity, amounting to the near-mythical busker’s only known recordings outside an eponymous classic for Bruce Gilbert and Graham Lewis’ Dome Records. Whether meshed with Stano’s drum machine and echoplex FX in ‘Seance of a Kondalike’ or layered with his Sitar and Stano’s tabla-esque tweaks in ‘A Dead Rose’, the effect leaves us a shivering mess, to be honest and still scratching our heads why there’s no recent, significant reissue of O’Shea’s own work. The rest of the LP is no less brilliant in it’s own way, roundly speaking to the diversity Stano, a self-described “non-musician”, and his intuitive way with sound. From the almost lusting funk of ‘White Field (In Isis)’, to the wild-pitching drum machine of ‘Blue Glide’, thru the icy elegance of the grand piano in ‘Out of the Dark, Into the Dawn’, to the sheer concrete sound design of ‘Melting Grey’ and again with that deadly machine swagger on ‘Emma Wild’ and ‘Room’, we’re left in no doubt this LP is a true, overlooked classic of its time.